Excel opens the Add-Ins dialog box showing all the names of the built-in add-in programs you can load. 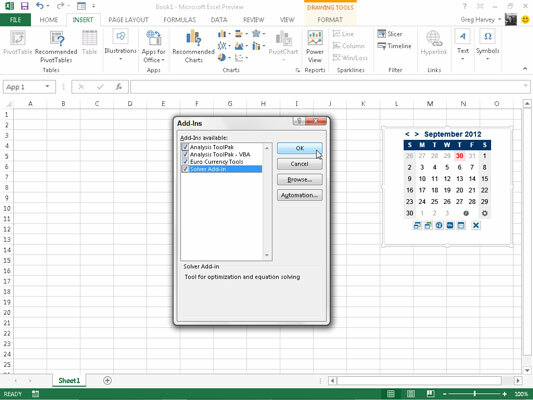 Excel places command buttons for the activated add-ins in an Analysis group on the Ribbon’s Data tab or in a Solutions group on the Formulas tab, depending on the type of add-in. Excel places the command buttons for the Analysis ToolPak or Solver add-in in the Analysis group on the Data tab. For the Euro Currency Tools, Excel places its command buttons in the Solutions group on the Formulas tab.